Politics is such an interesting subject in that President Maithripala Sirisena, who in 2015 dashed former President Mahinda Rajapaksa’s hopes to stay life-long in power and hand over the baton to his son Namal, seems to be hoping to come to power as President again, using the support base of the same Rajapaksas. He seems to have craftily planned the scheme, especially after the Local Government elections in February last year at which the Sri Lanka Podujana Peramuna (SLPP) unofficially led by Mahinda Rajapaksa swept the constituency by capturing power in more than 230 out of 340 councils. The results of these elections clearly predicted the possibility of the political comeback of Rajapaksas at any national level elections. The parties led by President Sirisena, the Sri Lanka Freedom Party (SLFP) and the United People’s Freedom Alliance (UPFA) had jointly been pushed to the third place at those elections. The ruling United National Party (UNP) had lost 1.5 million votes for the past three years and the SLPP had almost equalled the joint strength of the UNP and the SLFP. The President realized that his survival and the safety solely lay in a patch-up with the Rajapaksas, after these elections. And an already grown mismatch between his party and his partner in governance, the UNP helped him to get closer to Rajapaksas, his main adversary then. It is interesting to note that the bitterness between him and the UNP which helped him to reach out to Rajapaksas was initially the outcome of the slackness of the UNP in taking legal action against Rajapaksas and their loyalists over the allegation of corruption. At the same time, the desire to continue in office has grown in the President despite his repeated promises to the country that he would not go for a second term. That might be a direct upshot of his insecure feelings in light of Rajapaksa having been emerging fast as a force. All these factors might have prompted him to launch the Constitutional Coup, as many people call it, on October 26 last year, by unseating Prime Minister Ranil Wickremesinghe and replacing him with his prime adversary, Rajapaksa. "Ranatunga said that the SLFP was planning to vote Maithripala Sirisena into Presidency again by forming a coalition with the SLPP, but they would not allow that to happen"
President Sirisena might have calculated that given the fact that Rajapaksa has been debarred from contesting the Presidential election under the 19th Amendment to the Constitution and the rumoured cold war within the Rajapaksa family over the Presidential candidacy, the former President might agree to enthrone him again, if he grew a strong bond between the two, by the time of the Presidential election. 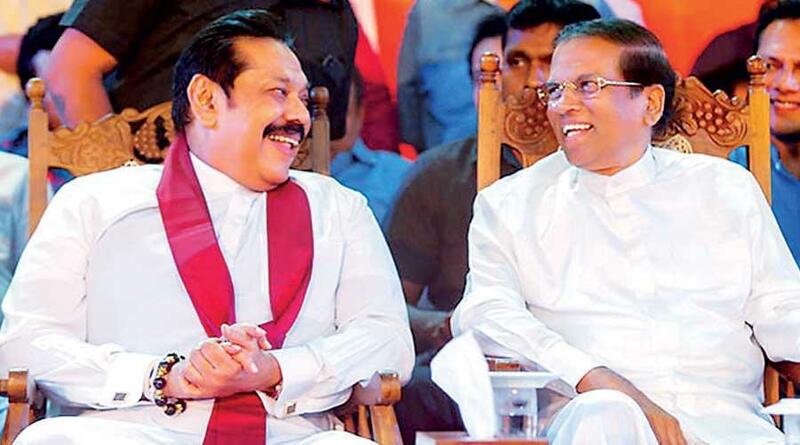 Rajapaksa too was amenable to this coup for various reasons. One is that he wanted to scuttle the investigations and court cases over allegations of corruption against members of his family and his loyalists. Secondly, the SLPP might not manage to secure 50 per cent valid votes at the next Presidential polls given that the unpredictable President chose to team up with the UNP. Yet, he would never allow the man who dashed his lifelong hopes some four years ago to be voted into Presidency again. What he would not say openly was told bluntly and in an unfriendly manner by one of his close allies, Parliamentarian and former Western Province Chief Minister Prasanna Ranatunga on Sunday at an SLPP meeting in Kotugoda. Ranatunga said that the SLFP was planning to vote Maithripala Sirisena into Presidency again by forming a coalition with the SLPP, but they would not allow that to happen. 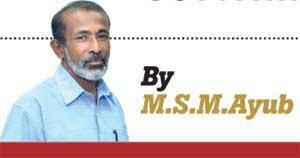 He said his party, the SLPP, wanted to coalesce with the SLFP only to topple the UNP led government. Thus both sides want to use the other’s vote bank to come to power, saying that the UNP is destroying the country’s economy. "Opposition, but especially to circumvent the Presidential election from being held before the Parliamentary Election"
It is against this backdrop that the coalition talks between the SLPP and the SLFP are ongoing. It is nothing but playing hide and seek. a traditional Opposition, but especially to circumvent the Presidential election from being held before the Parliamentary Election. If a general election is held as a result of the repeated defeat of the budget, Mahinda Rajapaksa seems to be of the opinion that he would become the Prime Minister through a subsequent general election with a majority power in Parliament. It would pave the way for him to contest the next Presidential election by bringing in the provisions of the 18th Amendment to the Constitution again after buying over MPs from other parties. In the meantime, there are unofficial reports that Mahinda Rajapaksa has given his nod for the Presidential hopes of his brother, Gotabaya Rajapaksa. "The unfortunate and pathetic situation is that the people have been intoxicated with these political power games among leaders of political parties, without being able to think about their own future and finding rulers accordingly"
Also, some reports said that Rajapaksa brothers had had a meeting among themselves to decide on the Presidential candidacy days ago. These reports might have infuriated the President, apart from showing the degree of nepotism within the SLPP leadership. It is against this backdrop that Health Minister Rajitha Senaratne said last week that the UNP and the President have mended their fences with each other. If this statement was not habitual rhetoric by Senaratne, one has to deem it as an intimidating message sent by the President to the SLPP, by showing friendly gestures to the UNP, such as the voting in favour of the Budget. And on the other hand, in the light of the SLFP having not voted against the budget, SLPP might not be able to ignore Senaratne’s statement. However, the cold war between the SLFP and the SLPP or a permanent separation between the two parties is most unlikely to help the UNP, given its highly poor performance at the last local government elections. And there are no indications that the UNP has improved its vote bank despite it having announced the projects such as the Gamperaliya. The unfortunate and pathetic situation is that the people have been intoxicated with these political power games among leaders of political parties, without being able to think about their own future and finding rulers accordingly. Hide and seek is not a new concept for these two buddies they have been playing it for decades and taken the general public for a long, long ride. People are not fools anymore.They will give both jokers a fitting answer very soon.